Do you want to replace your water heater? Hire a plumber for safety! You will get a licensed, qualified and experienced plumber who will install the water heater correctly. He will also make sure that all of the safety features are in place, and installed according to the current local plumbing code. Installing a water heater yourself is dangerous and improperly installed water heaters are a daily occurrence, putting at risk many homes in the country. We are quick to respond to phone calls with our team of operators working around the clock. We carry spare parts in our trucks and usually guarantee same-day electric hot water heater repair service. If you find a fault with your water cylinder and need it to be repaired fast, call Plumbers of Hollywood. We have years of experience installing, repairing and maintaining hot water cylinders. We are licensed plumbers specialized unvented water cylinders and hot water heater repair service. We proudly service a broad range of brands and models, from leading hot water heater manufacturers in the US, including discontinued models. On top of hot water heater repairs, we also offer new water heater installations, and many other services. 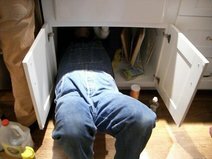 Contact Plumbers of Hollywood today at the following number: 954-210-5131. Tankless hot water heaters are also covered by our service. We do tankless water heater installation and repair. Did somebody ever tell you that your water heater is the most dangerous appliance in your house? Water heaters can leak water and thus cause thousands of dollars in property damage, they can create nagging mold problems to floors, walls, ceilings and foundations. Water heaters can leak gas which would be not only dangerous but also potentially deadly. Hot water heaters can leak carbon monoxide, it can kill you but unfortnately it doesn’t smell and cannot be seen either. Are you running out of hot water? We can find a solution to meet your needs with your own supply. Are you paying to heat water even when it’s not being used most of the day? Save money with our cost-efficient solutions. Do you notice water leaks on the floor by the water heater from time to time? Time to go dry, we can help you. Do you have to re-light your water heater pilot often? Proper service can eliminate that issue and save you time and energy. Would you like to extend the life of your water heater? Contact us now to see how we can help. What shortens the life of your water heater? So many questions, we would be happy to talk to you and advise you on the best course of action you should take. Call us or email us now for a free estimate!